Driving Arches National Park in Moab, Utah is right up our alley! We are not hikers in anyway, shape or form. If you want to see incredibly beautiful rock formations on a nice leisurely drive, in some of the most stunning landscape on the planet? Arches National Park just north of Moab, Utah in the eastern portion of the state, will check all those boxes! Bordered by the Colorado River in the southeast, it’s known as the site of more than 2,000 natural sandstone arches. We had didn't camp here, but we found good campgrounds in Moab. Our first stopover was not a National Park, but it was a National Forest. Fishlake National Forest is a beautiful place off the 15 highway. We looked around and found what looked like a good place to camp at Tushar Lakeside Recreation Site in Fishlake at 9000 feet above sea level. The weather was spectacular and the drive from Beaver, Utah off the 15, up hwy 153 then right on 137. The canyon brought us up the mountain to our campsite which wasn't too busy and we had our pick of sites. We found one and settled in and constructed our tent, porch and built a fire. Once getting to bed we realized we had an issue. We were ill-equipped for the cold mountain air. It was August and the weather was warm. Once the sun went down, the chill set in. Lows that night were in the high 30s. We slept in hoodies, jeans, and extra layers and made it through the night without freezing to death. The lake near our campsite was called Lower Kents Lake and was a picturesque little "lake" (more like a pond). We drove around the area after packing it up and headed through the mountains on a beautiful trail making our way to highway 70 for Moab and driving Arches National Park. On the way to Arches from Fishlake, we stopped off at a roadside formation about 30 miles outside of Green River, called the San Rafael Swell. Its a geological formation caused by an upheaval of earth then eroded away to a moon-like terrain. We stopped off, took a break and snapped some pictures. 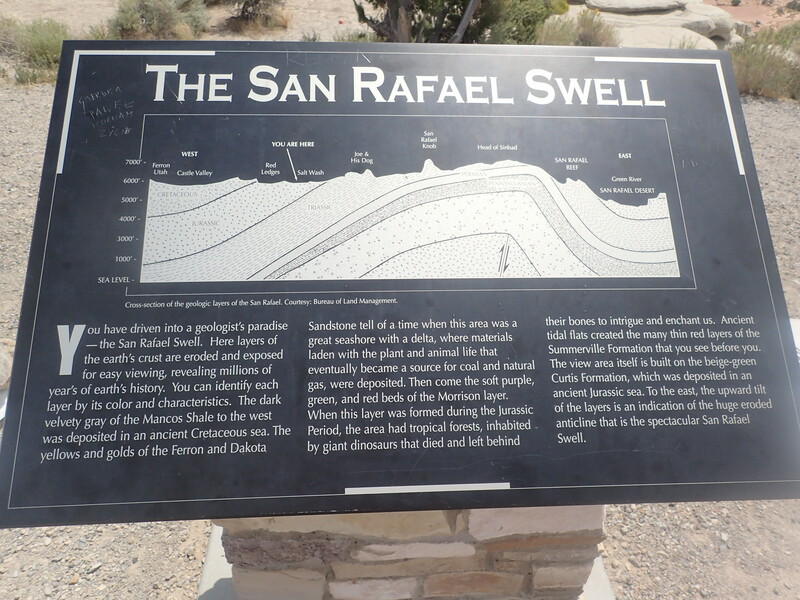 It's worth a stop to see some geological formations unique to the world. From I-70, take Exit 182 (Crescent Junction). Travel south for 27 miles to the park entrance on your right. From Moab, take Highway 191 north for 4.5 miles to the park entrance. Arches is five miles north of Moab on US 191. You can drive the park any time of year unless the road is closed due to snow. Here is an infographic that can help you know the best time to go and avoid the crowds. As you can see we went at one of the best time for crowds in the summer months in August. You might want to avoid big summer holidays like Memorial, Independence, and Labor days. The visitor center is open every day except Christmas from 9 am to 4 pm. 3-4 hours is a safe amount of time to see most of the arches and walk around some of the easier arches to see from the road or parking lots. 8 hours would give you enough time to hike to some of the lesser accessible arches such as the iconic Delicate Arch, Broken Arch, and Double O Arch. The drive from the entrance to the Devils Garden area of the park is 18 miles. So it's safe to say around 40 miles total to drive the entire park. Is it wheelchair and disability friendly? Yes and no. Some of the areas are not exactly wheelchair accessible and can be quite a hike for those with health issues. Most of the arches can be seen from the parking lots and the road as you drive through the park. Although not completely accessible to those with disabilities, It is one of the better National Parks for those who have difficulty walking and can really enjoy the arches without leaving your vehicle. According to the 2018 fee schedule, entrance fees increased on June 1, 2018. Admits one private, non-commercial vehicle (15 passenger capacity or less) and all its occupants. Admits a private, non-commercial motorcycle and its riders. Admits one individual with no car. Typically used for bicyclists, hikers, and pedestrians. Youth 15 and under are admitted free. Are there any facilities for refueling, food, and lodging? There are no facilities other than a few bathrooms throughout the park. There is a 50 site campground called Devils Garden Campground that is open all year and requires advanced bookings from March 1st to November 30th. The campgrounds are open year around 24 hours a day. No gas stations or restaurants are available in the park itself. We are going to split the drive up into 3 sections. The lower section, middle and upper sections of the drive. The lower section of the drive after you leave the visitor center takes up a hill giving you a glimpse of some of the sheer red cliffs until you arrive at the first set of geological formations called Park Avenue. The parking lot is around 2 1/2 miles from the visitor center and has a well-paved walkway to an overlook, then down a narrow path over rock and dirt to the trail that is around 2 miles roundtrip. It's not wheelchair accessible or hikable for those with physical disabilities. It's basically a hiking shortcut to the Courthouse Towers parking lot and the trail can be reached by both parking lots. Further up the main road is the La Sal Mountain Overlook. Further up the road, you have a visual of The Courthouse Towers which include the Tower of Babel, Sheep Rock, Three Gossips, and The Organ. All of these can be photographed and enjoyed from the road or in the parking lot. Some of the formations are obviously named for their shapes. The Organ, however, doesn't look like the instrument and we found many more formations that looked more like an "organ" (body part). Freud would say some of the phallic shaped formations "are just formations"( I would assume). The Middle Section of driving Arches National Park was our favorite. The formations included the Balanced Rock, Garden of Eden, Cove of Caves, Double Arch, Turret Arch and the North and South Windows. This area was busiest of the place we went to as well. The parking lot was full of cars and people walking all over the place. We decided to get out of our car and hike around the Garden of Eden and its developing balancing stones. After hiking around and snapping some pics, we ventured further up the road. The Cove of Caves to the left also showed the back side of the Double Arch and around the corner, we found the North and South Windows with Turret Arch. This was by far our favorite formations! The walk up to the windows is relatively flat and a nicely packed dirt trail with small steps leads you to the North Window. We sat for quite a while under the shade of the arch and gazed out to the desert. We had a full view of the Turret Arch and Double Arches from here. This was the busiest of all the formations we saw that day, and after we had our fill of the incredible views, we made our way down to the parking lot. It was easily in the 90s by now and as we came to our car, another care from California had a pit bull locked inside. We could see the dog panting and no water in a dish that was tipped over in the back seat. We were furious! We sat there and watched the dog contemplating if we should break the window. Within a few minutes of standing there, a young couple came to their car and we gave them an earful. To leave a dog in the car is one thing, but to do so in August in the desert is just stupid! The couple was scared to death of Brady and merely hopped in their car and took off. After yelling some expletives, a crowd formed as the couple drove off speedily. We didn't see them again that day but kept an eye out for them. If I would have seen the dog in that car again, I would have broken the window so they couldn't leave him in there anymore. Some people!!! The Upper Section of driving Arches National Park was more difficult to see from the car. Some hiking at times was necessary to get a closer look. As we aren't hikers, there are fewer pictures of these formations and not our favorite part of the drive. We did head down to the Delicate Arch parking lot and Wolfe Ranch. The Delicate Arch is the arch most associated when people think of Arches National Park. It's the iconic arch perched a mile away as the crow flies from the lower viewpoint 100 yards from the lot. The trail to see Delicate Arch up close and personal is a 3-mile round trip and climbs 480 feet, needless to say, with our bottles of water gone (we should have brought more) and temperatures near 100 at this point, we decided not to make the hike. We didn't see Wolfe Ranch cabin or the wall of Ute Indian petroglyphs on that trail either. We got back in the car and headed up to Devil's Garden Campground. Along the way, we could see the Fiery Furnace, Landscape Arch, and then we did the loop of the Devils Garden Campground and headed back to Moab for the day. The campgrounds look amazing perched in the rocks at Devil's Garden. We didn't go any further and if we wanted to spend days hiking around all the arches, we could easily spend a week here doing so. Our time at Arches was great! We only spent a better part of a day driving around and didn't hike or get out too much. But this is the beauty of this park! 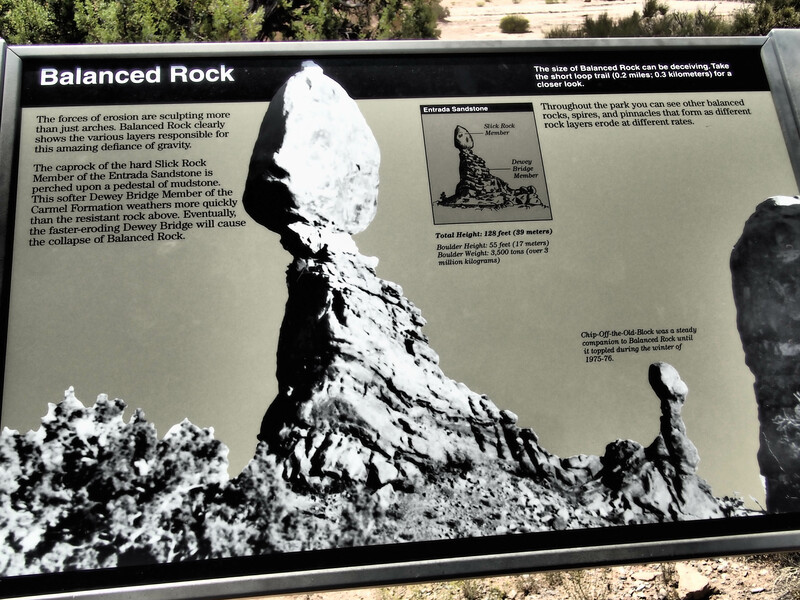 You don't have to get out of your car at all to see some of the most interesting and unique formations in the world. Millions of years in the making, Arches proved to be one of those places we didn't expect to be so beautiful. You can't grasp the size of these formations from a picture, and we were in awe of how wind and water can create such a thing. We didn't spend a long time at Arches, yet wish we had spent more. Had we more time and forethought, we would have pre-booked a campground in the park, and spent a few days exploring. We wanted to go visit my sister in Spanish Fork, Utah before heading up to Yellowstone National Park and didn't book a lot of time in Moab. 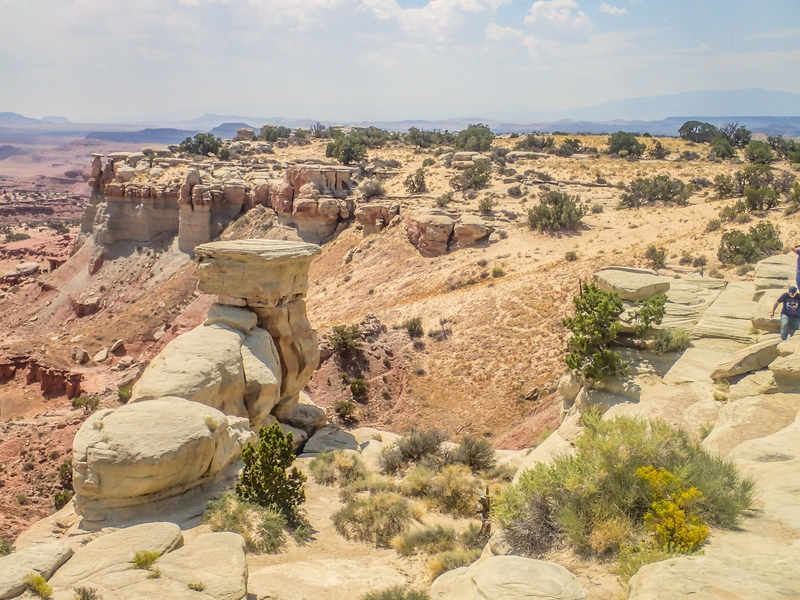 We understand there is a ton to do in that area of Utah, and we recommend you spend some time exploring the National Parks and Forests in that state. The diversity of the landscapes, beauty, and ease of access makes Moab and driving Arches National Park a trip to remember.